Congratulate the parents on their childs first birthday or day of birth with this adorable bear hugging a bud vase. 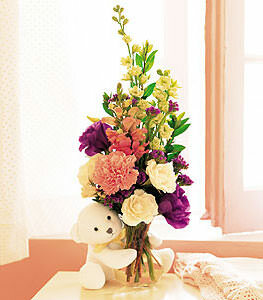 Larkspur and roses arrive in a glass vase adorned by a cuddly white bear. Bear & vase may vary from item pictured. Not available in all areas.